Ireland captain William Porterfield. Pic by INPHO. 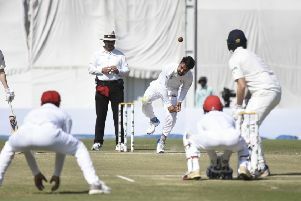 Ireland were resolute, but a 139-run stand between Ihsanullah Janat (65*) and Rahmat Shah (76) on the fourth day propelled Afghanistan to their first victory in Test cricket as they beat Ireland by seven wickets at the Rajiv Gandhi International Stadium in Dehradun. Ireland’s batting display on the third day, led by Andrew Balbirnie’s 82, had helped them bounce back in the game, setting Afghanistan a target of 147. The early evening wicket of Mohammad Shahzad had given Ireland a glimmer of hope, and when Shah and Janat took guard on the fourth morning, the Test was in the balance. With George Dockrell and Tim Murtagh taking the ball for Ireland, back-to-back fours off Murtagh in the second over of the day by Shah signalled the Afghans’ intent. Shah gave one opportunity shortly after, but Stuart Thompson couldn’t hold on to the catch at cover. Following that the story of the morning was the visiting bowlers bending their backs in search of a breakthrough, but their opponents remained solid at the crease. It was James Cameron-Dow who finally broke the deadlock, as Shah was stumped for 76 in the 48th over. However, it was too little too late for the visitors, with Afghanistan just three runs from victory. Mohammad Nabi, the next batsman in, seemed in a hurry too, as a scramble to find the second meant he was run-out off the very next delivery. Hasmatullah Shahidi, the next batsman in, was the one to hit the historic runs for Afghanistan. With two left to win, the right-hander pulled the ball to deep square leg, scripting a historic victory for his side. Shah was named Player of the Match for his two half-centuries. 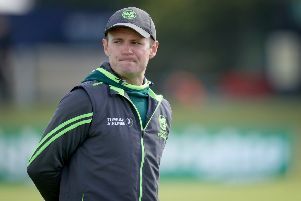 After the match, Ireland captain William Porterfield said: “It was obviously going to be a tough ask today defending 147, but it was the first innings where it went wrong for us. “I thought at the time that winning the toss was a big toss to win, and any multi-day game you have to capitalise in the first innings. “If we had done that, if we had batted remotely like we did in the second innings in that first innings, then I think it could have been a completely different game. “Instead you would have been then chasing a score upward of 280 or 300, which would have been a completely different story. “But take nothing away from Afghanistan and how they played, they played well throughout the game and came out deserved winners. “This was our second Test, with five lads making their debut, but I’m very happy with the lads that came in, how they went about the game and how they prepared. “You obviously want them to kick on and make big contributions – we just didn’t do that in the first innings and from there you’re always looking at coming back into the game from there. “However, Afghanistan never let us do that, so you have to give congratulations to them. “It’s been a long tour - the lads had been in Oman before they came here - and to see the same ground and the same hotel every day can get a little long, but the lads have been very good, and when you have a Test match at the back end of the tour then you’re never tired of being here.